stickers wrote: Got both of mine in. Fixed the T-Latches with a lock washer on each latch. Now they work great. what was the problem & how did you fix ? The T-latches on mine were very loose and flimsy and when I went to shut them the latches would keep it from shutting. Now they will stick straight out/up like a Yeti and cause no problem in shutting. Both of the ones I ordered were the same way. stickers wrote: The T-latches on mine were very loose and flimsy and when I went to shut them the latches would keep it from shutting. Now they will stick straight out/up like a Yeti and cause no problem in shutting. Both of the ones I ordered were the same way. Crap, 65 qt sold out!! i didn't figure they would stay on sale/last as long as they did.. I went ahead and ordered the 45, but I need a 65. Will do. It is very simple. Take a screwdriver and pry out the 2 silver rods that hold on T-Latches and when you reinsert the rods just put a small lockwasher on the rod next to the T-Latch. You only have to put 1 on each latch and it holds good. What it does is create enough friction that the latches stay up. You might also use a hammer to get screwdriver started behind the rod to pull it out. Yeah, just kind of aggravating. And I am afraid a big ole crappie might knock it open and get back in the water, ha. When you look at the Yetis I believe they have a washer stuck in there to begin with. I might be wrong but it sure looks like it. I will check my yeti when I get home to see if it has washers. What size hole do I need for washers and it needs to be a lock washer? triple_duece wrote: I will check my yeti when I get home to see if it has washers. Not sure what size hole it is. I just pulled out the pins and matched them up with some I had laying around. You could probably use regular washers but I think it will take 2 per latch with one on each side of latch. No washers on my yeti. Also my yeti latches are loose now after being in the weather for some time. Doesn't bother me either way as I latch them when I close the lid. 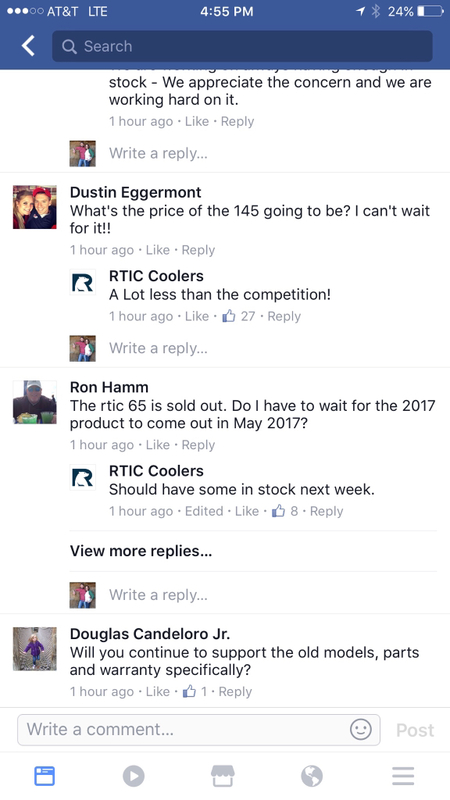 well, this may well be why they are selling all the RTIC coolers so cheap?? 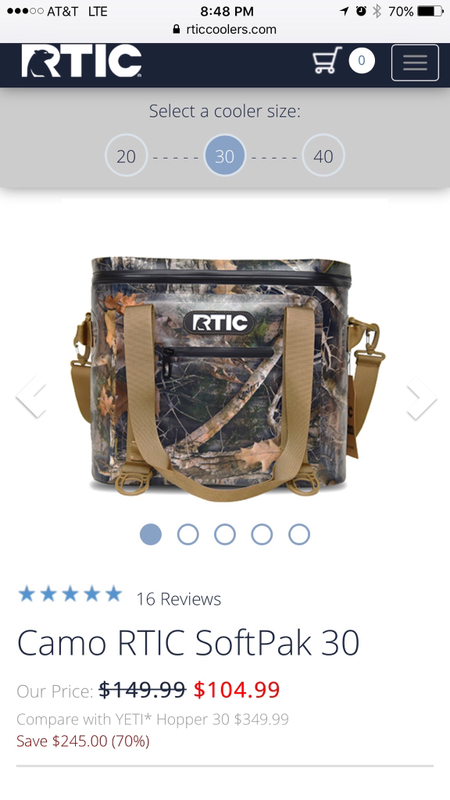 CYPRESS, Texas, Feb. 2, 2017 – RTIC, the leading direct to consumer online retailer of premium coolers and drinkware announces that it has entered into a settlement agreement with YETI today for the purpose of avoiding the additional costs and uncertainty of continued litigation. The dispute has been amicably resolved and as part of the agreement, RTIC has agreed to redesign only those products involved in the dispute. As part of the Agreement, RTIC is precluded from commenting further, but RTIC is very pleased with the settlement and considers it a win. 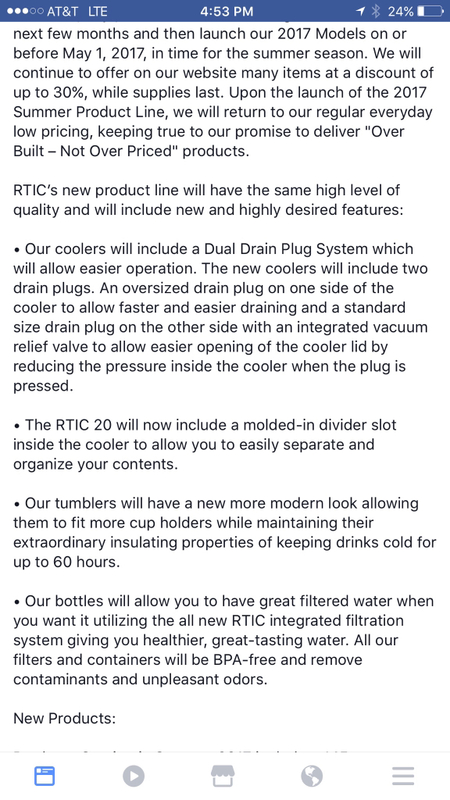 RTIC had previously announced last month changes to its 2017 product lines and expects to rollout new products and updated existing products starting in early Spring. 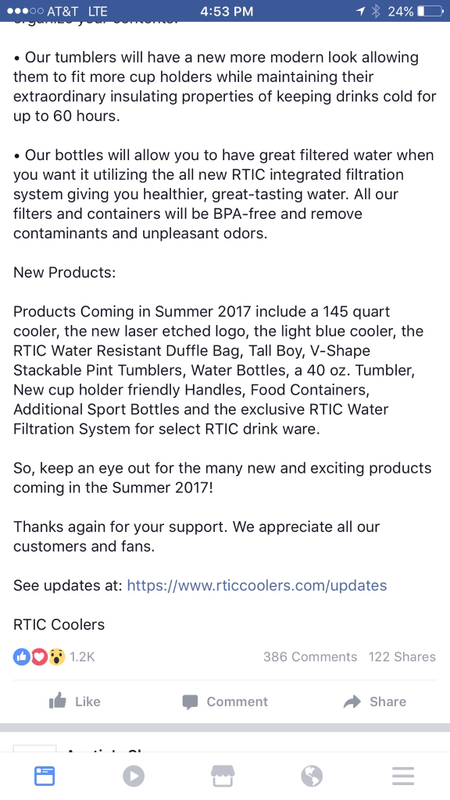 RTIC will continue to operate as normal selling all the RTIC brand of products as provided on the www.RTICcoolers.com website keeping true to its promise to deliver "Over Built – Not Over Priced" products to all its RTIC fans & customers. I ordered me this one. Already have a 45 yeti and a 55 k2. I put the washers on my RTIC cooler yest, and def makes a difference. i also found that using one lock washer works better than using flat washers..
Also, my 65 qt was missing the drain plug, and my 45 qt was damaged (looked like someone took a grinder to the corner) , but the damage was minor and will not effect functionality one bit. i sent RTIC and email stating that info, and in less than 2 hours they have shipped a replacement plug for the 65, and are refunding partial payment for the 45 (in essence selling it at discount). i am very pleased with their customer service ! i figured it would be several days before they got back w/me. My 45 arrived in perfect condition. All 45's are currently out of stock. I tried to get a few buddies to buy 1, but they waited too late. The white 65 was back in stock today, but not on sale any more.